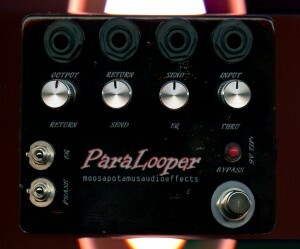 Here is a totally different version of the ParaLooper. 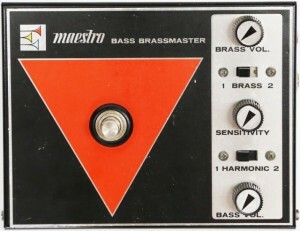 It’s a blend pedal that is based on the Maestro Bass Brassmaster, which is why the title of this post is The Brass Blender. 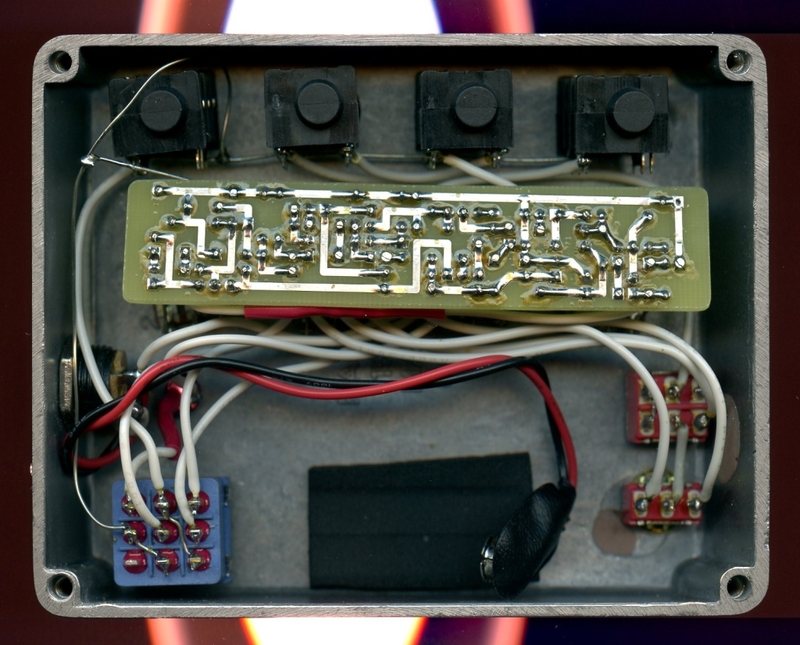 The circuitry inside is exactly the same as the Brassmaster, except that all the parts related to producing the fuzz sound have been left out. 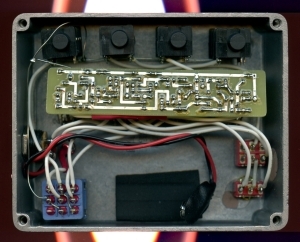 What’s left happens to be a very nice, flexible blend pedal. Here you can get an idea of what parts were removed and see what remains. Specifically, the diode rectifier, transformer and filter section have all been removed. R11 (150K) can be mounted directly on the EQ bypass switch. It’s sized to match the gain reduction that you get going through the BMP tone block, so when you bypass the EQ, the volume of the Send output doesn’t change. But personally, I just put a jumper on the switch instead. 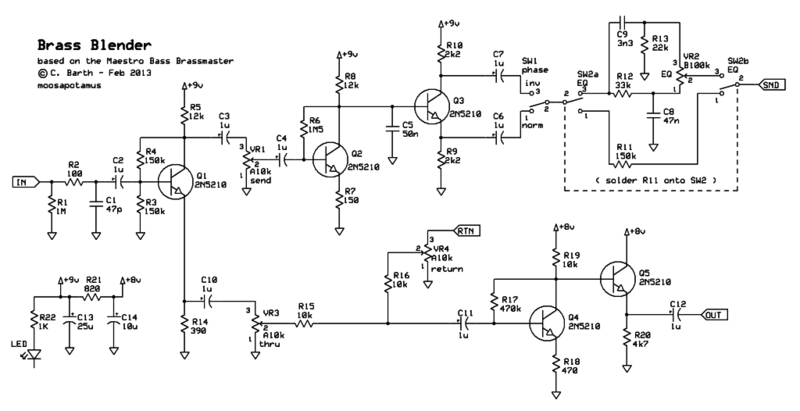 That way, you get even more gain when the EQ section is bypassed. R15 (10K) gets attached to the board with a pair of flying leads (because I didn’t feel like adding a whole extra row to the PCB layout just for one resistor). It’s the wire with the red shrink sleeve that spans the width of the PCB. All the pots are mounted directly to the PCB with bare 22awg buss wire (same stuff I used for the ground wiring, see pic below). Of course, in the above picture, they have not yet been soldered into place. I mount the pots in the enclosure and slide the PCB assembly down the wires as far as possible (within reason), then solder in place. I/O jacks are mounted on the face of the enclosure to save space on the inside, allowing the row of pots to be shifted a bit farther north of center then they would have been if the jacks were mounted on the top edge. This helps to get the pots a little farther away from the stompswitch, too. This is probably a bit more complex than the typical blend pedal. But it also has a number of features and capabilities that are not always found on a ‘typical’ blend pedal. There is an inordinate amount of gain available from the Send level control, so you can really slam the piss out of whatever you plug in to the effects loop. This can completely change the sound of some dirt pedals, in particular. 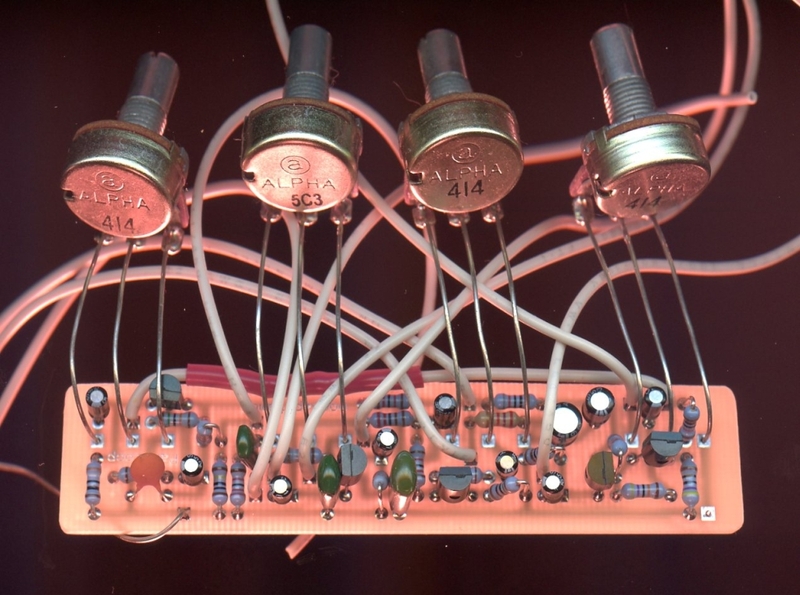 There is a phase splitter which was already part of the original Brassmaster’s design. So you can easily flip the phase on the effect loop whenever you want. In practice, I don’t even really think about whether the phase is normal or inverted. I just set the Phase switch to whatever position sounds best to me. Right after the phase splitter, I added a BMP tone section that goes to the Effect Send output – adds a lot of tonal flexibility. There is also a switch that allows you to bypass the tone section if you like. The Effect Return comes in to what was the Brass Volume pot on the Brassmaster and is now the Return level control. The clean signal path is unchanged and the Thru pot sets the clean level. This entry was posted in Mixing/Blending and tagged Blend Pedal, Brassmaster, ParaLooper by charlie. Bookmark the permalink. I would like to know if could you provide the layout and the pcb transfer of this project ?? The layout is already posted. Just doctor it up in Photoshop or MSPaint. I’m not sure if I still have a transfer image. Could you post the bottom image of the PCB? I’d be grateful. Thanks! All I can find is the layout already posted, above. So, use that and DIY, mates! 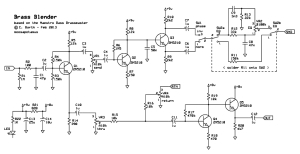 I couldnt find a 2n5210 transistor..
Can i replace it with other npn transistor? Yes, you can. I’m not sure specifically which will work the best, but you should be able to look up suitable replacements.